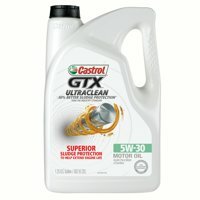 Product TitleCastrol GTX ULTRACLEAN 5W-30 Motor Oil, 5 QT. Product TitleMobil Super 5W-30 Conventional Motor Oil, 5 qt. Product TitleCastrol GTX ULTRACLEAN 5W-20 Motor Oil, 5 QT. Product TitleMobil Super 10W-30 Conventional Motor Oil, 5 qt. Product TitleCastrol GTX ULTRACLEAN 5W-30 Motor Oil, 1 QT. Product TitlePennzoil 10W-40 Motor Oil, 1 qt. Product TitleMobil Super 10W-30 Conventional Motor Oil, 1 qt. Product TitleCastrol GTX ULTRACLEAN 5W-20 Motor Oil, 1 QT.